One of the great things about working for an AMC (association management company) is the ability to draw from other association management professionals within the company. At IMI, we take advantage of this benefit by intentionally scheduling brainstorming meetings to share ideas across the different account teams. Align the agenda with the strategic plan. Review the strategic plan and outstanding board deliverables at the beginning of meeting rather than the end. Include an ongoing and regularly updated Excel spreadsheet of deliverables (what needs to be done, who needs to do it and projected completion date) to be addressed at the end of each meeting. Combine all documents into an Adobe binder and then use the bookmarks on the side for easy navigation during the meeting. Note: some board members may prefer to have original Word, Excel, etc. documents instead so they can edit them throughout the board meeting. Consider adding supplemental documents to a central repository area such as Central Desktop instead of including them in the conference binder. Work with board members, staff, etc., to create issue papers and discussion guides before bringing an idea or recommendation to the board. An issue paper should provide background on the issue, a list of pros and cons to be considered along with a recommendation for the board’s consideration. Create a cheat-sheet about when a motion is required and when it is not. 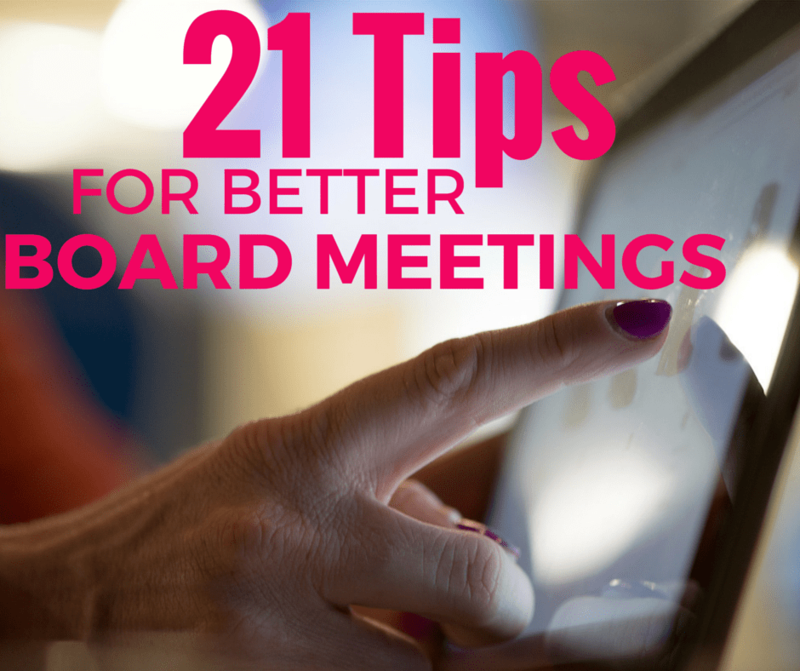 This is especially helpful to share with new board members or can also be included in the board packet for easy reference throughout a meeting. Practice “documentation, not elaboration” when drafting minutes. Remember there are legal reasons for not including too much detail, so leave out the conversation and names. Use the line number feature in Word when drafting minutes for easier proofing and corrections. Research the pros and cons of teleconferences vs. Webinars. More and more boards are moving away from teleconferences in favor of Webinar meetings as it allows everyone to view the agenda and any supporting documents. Consider recording the meeting and reviewing it later to take notes as it can be difficult to take notes and show the needed documents. Include a printed agenda packet and also project on the screen. This allows you to create an electronics-free zone so people aren’t distracted checking email, etc. Allot time at each in-person meeting for training/leadership exercises. Include video clips to highlight the “theme” of the exercise. Provide fidget toys to help meeting attendees relax, stay focused during long meetings, and think creatively. Encourage meeting attendees to turn their name tent on end to signal their desire to speak. Print the association’s mission statement on the back of name tent so it faces the board member. Include Roberts Rules cheat sheet at back of board binder which shows ways to move discussions along. Note: anyone on the board, not just the president, can help with this. Incorporate indicators such as holding up a red paper or other item to wrap up conversations when off topic. Assign seats, strategically setting out board tents ahead of time, as needed. Staff should excuse themselves from executive sessions whenever staff performance or the AMC’s contract is being discussed. Staff should plan to stay in all other executive sessions to take minutes unless asked by the board to leave. Note: it is generally a recognized practice within the association management industry for executive staff to stay in the meeting when the board moves to an executive session. Encourage a 48 hour discussion period during online voting to give participants from different parts of the world time to weigh in before a vote is taken. Do you have any additional tips to add to the list? If so, please share in the comments below!